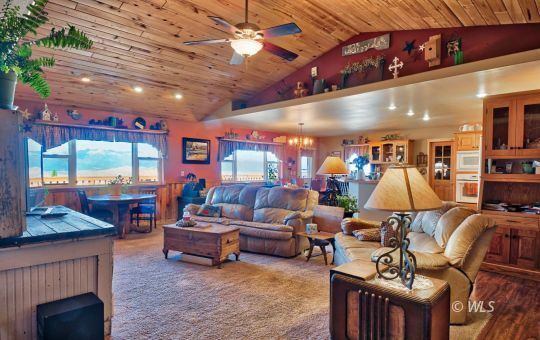 Westcliffe Real Estate - Custer County Homes - Martin & Tope Real Estate Co.
Westcliffe, Colorado based Martin & Tope Real Estate is the largest, most active Mountain Land Company in Custer County Colorado. Our exclusive inventory of Southern Colorado Mountain Real Estate ranges from 200 listings upward. Our website is updated daily, and contains the most accurate and up-to-date list of available properties in Custer County. We are open 6 days a week and are fully staffed to assist you with all your Colorado Property needs. You will experience good, old-fashioned service and hospitality when you contact Martin & Tope Real Estate. Looking for real estate in Custer County or Westcliffe, CO? Then you've come to the right place! Martin & Tope Real Estate is the most experienced office when it comes to Colorado mountain land, cabins, homes, and real estate investments. At an elevation of 7,888 feet - Westcliffe, Colorado (population 700) is the largest town in Custer County. The 100 mile Wet Mountain Valley has views of the Sangre de Cristo Mountains on the west (with peaks of over 14,000 feet) and the beautiful Wet Mountains stretching along to the east. Custer County, CO has a population of approximately 4,000. The school has an enrollment of about 500 and runs on a 4-day week schedule. Locals and visitors enjoy music festivals, art galleries, live theater, fiber arts shows, the annual stampede rodeo, a health club with an indoor pool, the St. Andrews Golf Course, a bowling alley, and the close proximity of rafting, snow skiing, and "big city" amenities. Feel free to search our website. If you would like any of our free services, please click the applicable links. If you see any listings that you are interested in or if you have any questions at all, please give us a call or drop us an e-mail. We look forward to helping you with your real estate needs! Martin & Tope Real Estate Co. is your premier real estate broker for buying or selling real estate in Westcliffe CO. If you would like to buy a home or cabin anywhere in Custer County, Fremont County, Huerfano County, Chaffee County, Pueblo County, or anywhere in the mountains of central Colorado, give us a call or drop us an email. We specialize in mountain cabins, second homes, all types of residential real estate, commercial real estate, lots and acreages, and farms and ranches. We cover the following areas: Aguilar, Avondale, Beulah, Bonanza, Buena Vista, Canon City, Coal Creek, Coaldale, Colorado City, Cotopaxi, Crowley, Florence, Fowler, Gardner, Guffey, Hillside, Howard, La Veta, Penrose, Pueblo West, Redwing, Rockvale, Rosita, Rye, Saguache, San Isabel, Silver Cliff, Texas Creek, Turret, Walsenburg, Westcliffe, Wetmore, Williamsburg. We are committed to excellence in helping each buyer and seller with their specific real estate needs. All of our agents are professional, experienced, and well trained. With Martin & Tope, you can expect the best! M&TB25-4 BEDROOM RANCH HOME ON 6.27 ACRES-HUGE VIEWS!